My cake is finished and I am proud to show it off to the world! 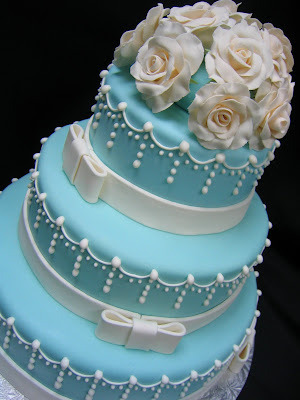 I have always wanted to make a Tiffany & Co. robin's egg blue cake and the colour contrast with the ivory details is very eye-catching. 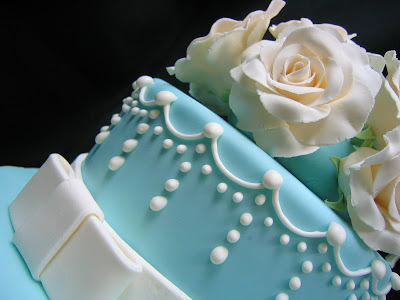 Piping with royal icing was the most enjoyable part of my cake's creation. 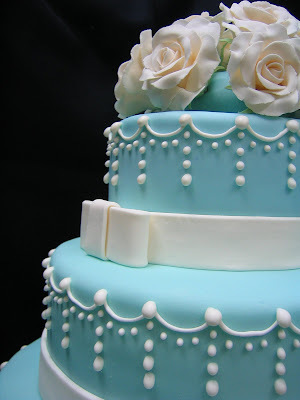 Honestly, I think that I could sit for hours piping royal icing and be perfectly content. The beads were purposely piped to have a "drop" effect by making my royal icing more liquid in consistency. Interestingly, the ivory fondant bows and ribbons were formed from commercially prepared rolled fondant which was hiding in the pastry kitchen and I admit that it was very easy to use with the perfect texture which did not seem to ever dry out. Unfortunately, Pan Pacific rules prevent me from bringing home my lovely wedding cake but really, what would I do with it anyways? The past week has been spent designing and creating a wedding cake. My hypothetical bride is very classic and elegant, with clean and simple taste. I was inspired by the beautiful blue and white of traditional Wedgwood Jasperware china. Hopefully, it will be completed by Monday so stay tuned! Meanwhile, many hours of preparation and practice are needed to create flawless and structurally-sound wedding cakes. My cake is a display cake made of styrofoam rounds which were constructed by cutting out and stacking discs from leftover styrofoam salmon boxes. Each tier was then masked in Italian buttercream and then covered in rolled fondant. 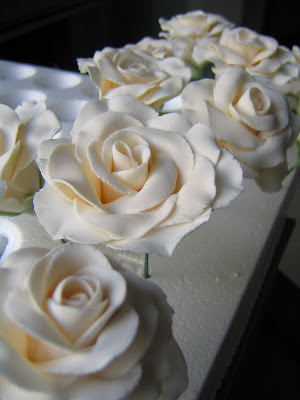 At home, I converted my kitchen into a small gum paste rose factory which painstakingly produced 14 ivory roses, each rose taking me at least one hour of labour in total. This cake exercise has taught me not to rush to complete a project simply for the sake of getting it done. When my rolled fondant was too dry and cracking everywhere, I had to produce a new batch reluctantly. And when one mischievious tier just would not cooperate and kept being lumpy, I had to discard the used fondant and make an additional batch. Ultimately, it took me an entire day filled with frustration and attempted patience to cover my three tiers but it was worth it because now I know how to do it right! The past week has been extremely busy for me. Mother's Day Brunch was massive; the preparation on Sunday morning was controlled mayhem as the whole team assembled all the last minute items for the buffet. The highlight of the event for me was making two croquembouches by myself, one of which was at least 2 feet tall (without using a mold), and placing them onto the buffet table. I was able to admire my perfectly conical croquembouche there for 3 seconds before a guest began to rip it apart while I internally gasped in shock at its destruction. Meanwhile, my plated dessert assignment required a considerable amount of preparation during the week and ultimately, my three creations were well received overall. The common theme to all three desserts was a mocha mousse which I used in three different ways. Chef Ted gave enormously constructive feedback with which I totally agreed. 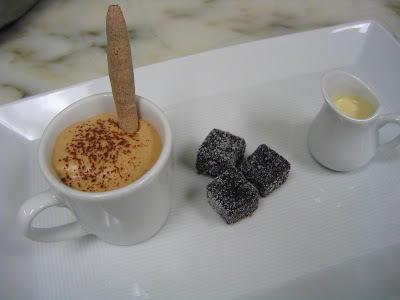 For example, in my first dessert, the mocha mousse in the espresso cup was too firm and required a different element for contrast within the cup. The cassis pâte de fruit "sugar cubes" were cut too large but my Bailey's sauce Anglaise was lovely. My second dessert, a Concorde, was my favorite. 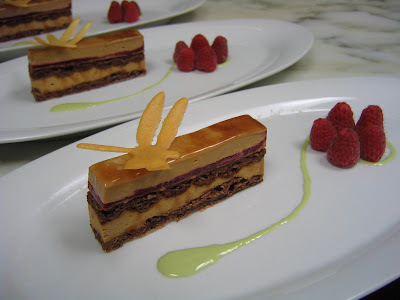 The mocha mousse was sandwiched between layers of cocoa meringue along with a thin layer of raspberry gelée. It was accompanied by a pistachio sabayon, fresh raspberries and accented with my signature dragonfly tuile (which has made several appearances previously at school). For an even better plate, the dragonfly should have been tilted forward so it could be viewed fully from the front and placing fewer raspberries in an alternate position would have allowed the sabayon design to be visible. My third dessert was fraught with mistakes in presentation although the flavour combinations were delicious. 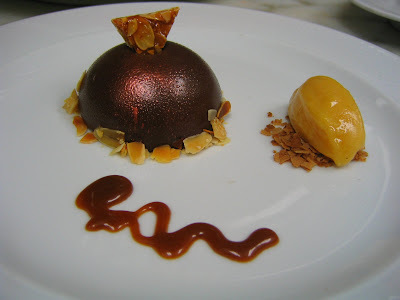 The mocha mousse domes were glorious before they were put on the plate, filled with an amaretto crème brûlée, crumbled nougatine, on an apricot financier base, glazed with dark chocolate ganache and a hit of copper metallic powder. Unfortunately, when I plated it, the edges were messy so I tried to hide it with flaked almonds which cheapened the look of the plate. The caramel sauce which I made in advance became too thick and dribbled unpredictably off my spoon into an unattractive blob; however the apricot sorbet was deliciously refreshing. I recognize now that having a creative outlet is a key component to my professional happiness. The challenge will be to find employment in the local pastry industry where a happy medium balances productivity with creativity. My fear is that this does not exist, at least for an entry-level position where the focus would be on producing what you are told to produce without a hint of creative freedom. But enough of fear...simply enjoying this time to experiment and learn should be my focus! This week, my self-assigned project was to explore the world of gelées using gelatin, agar-agar, and pectin. Gelatin is a staple in the pastry kitchen and is vital in almost all mousses. I used Ganache Pâtisserie's mango-passionfruit-lychee gelée inside a coconut mousse dome. Agar-agar is derived from seaweed and I used a recipe from pastry school to create a rooibos tea jelly. Pectin is more often associated with making jams; however, a classical French confection called pâte de fruit also uses pectin and my favorite is raspberry pâte de fruit. 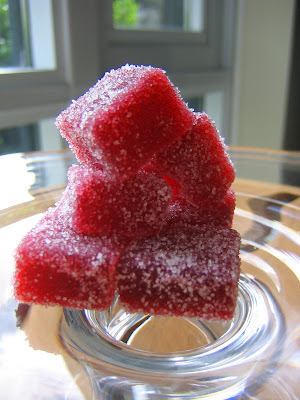 These small sugar-coated cubes of intense fruity goodness are divine. In France, we saw huge displays of multitudes of pâtes de fruits in a rainbow assortment of flavors. My first encouter with pâte de fruit was at pastry school but unfortunately, I never succeeded at making it correctly on my first 3 attempts. It was only during my practicum at Ganache that I learned why I had failed. The key to the perfect pâte de fruit is not to simply cook to a specific temperature, for example 105 degrees Celsius. Instead, learning to recognize the proper consistency as the endpoint, regardless of the temperature, is paramount. It taught me to not be so reliant on my digital thermometer (which was often inaccurate) and that the eye is just as powerful a tool, especially when cooking sugar. This lesson is applicable to everything in the pastry kitchen; without fully understanding why you are doing what you are doing in a recipe or what is actually happening to your ingredients, you will never be able to troubleshoot or know how to improve your product. Meanwhile, next week's assignment is to present one product in three different ways as three separate plated desserts. For example, I could make a strawberry mousse and use it in an individual entremet, or in a clear sherry glass, or pipe it onto a meringue shell. My artistic skills have been somewhat dormant these days because I have been so focussed on production and efficiency rather than creativity. But I suppose, success in the pastry world depends on having both artistry and productivity!